Posted in card making, Challenge, distress ink, ideas, stamps and tagged cards for soldiers, Christmas cards, distress ink, distress markers, handmade cards, holiday cards, My Favorite Things hybrid ink, Operation Write Home, peace joy love, stampendous, studio g. Bookmark the permalink. First I neglect my blog now I can’t stop writing? What’s the deal? Well, I decided that I had some down time while I was in a creative block and I thought writing might help. I did my Sketch Sunday video, edited it and uploaded it to YouTube. And that’s the reason for this post. I was going through my supplies earlier today because I wanted to use something that I haven’t used in awhile. I found some Hero Arts Neon inks that I just HAD to have. It’s not that I didn’t use them because I did. But, unlike my distress inks, which I seem to use for every project, I haven’t used these in awhile. I also saw the pack of kraft card stock that has been sitting in my cube underneath my tv for awhile, unused. I had never tried neon inks on kraft (or at least if I did I don’t remember). I thought that I would give that a try. I only ended up using one color on the kraft card stock for this project. (On a practice piece, I used all four neon inks that I have). I love the results because it’s not as neon as if you used them on white, but it’s still pretty vibrant. Posted in card making, Challenge, deals, ideas, stamps, YouTube and tagged Gina K Designs stamps, Hero arts Neon inks, inspiration from a sketch, kraft card stock from recollections, scrapsecrets, simon says stamp stamps, sketch sunday, using a sketch to create a card, YouTube. Bookmark the permalink. I made a Mickey head the other day from the Mickey and Friends cartridge. Of course I can’t find it now to take a picture. One of my new followers was asking about the Disney cartridges I got recently after she watched one of my videos. She wanted to know how difficult it was to make some cuts from the cartridges. I watched other people’s videos and learned some tips and tricks. I leaned that if you used the slowest speed, the cuts come out better. Also, make the cuts the biggest size possible. I made a video of all the tips and tricks and posted it on YouTube. http://m.youtube.com/#/watch?v=cQQkbsDAgPw&feature=plcp if you want to check it out! Im not overly thrilled with the way Alice turned out. You can recognize that it is her and I’m sure that most people wouldn’t notice the things I did notice. 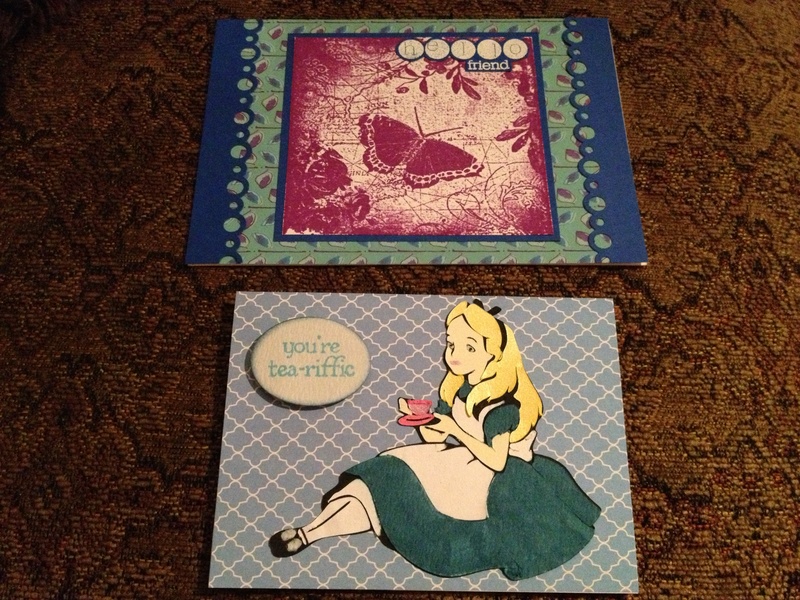 I did have fun making Alice in Wonderland though and I can’t wait to make the other characters on the cartridge. Yesterday, I made two characters from the Mickey and Friends cartridge. 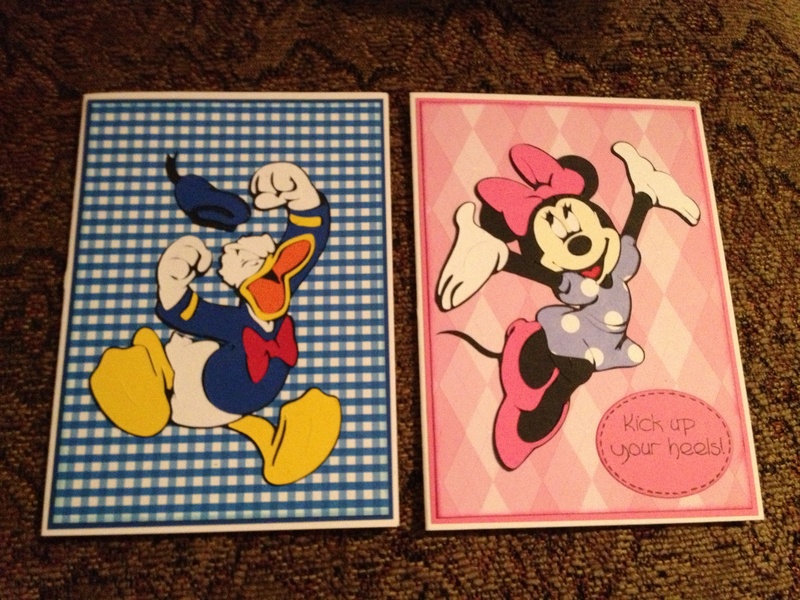 I made a Minnie Mouse and a Donald Duck. When I was at AC Moore a couple of days ago, I bought a bunch of the $1 bin stamps. One of them said “Oh Heck! I missed your birthday”. I made the Donald cut of him jumping up and down, where he looks like he’s mad. I thought that it would be perfect for that sentiment. The Minnie Mouse cut I used was the one of her jumping in the air. I used one of the My Pink Stamper stamp sets that has the stamp “Kick up your heels”. The interior of the card is blank so it can be a thinking of you or a get well card. I am really happy with the way those two cards came out. 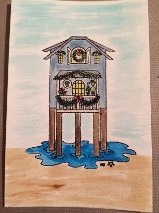 The last card that I made was one using a new stamp I got from AC Moore and a new paper pack I got from Joann’s. I also used a Fiskar’s edge punch that I never used before that I thought mimicked the bubbles in the “Hello Friend” stamp I used. It was from another stamp set that I got from the $1 bin. I used VersaMark and some Stampendous white embossing powder on the sentiment. Here are some pictures of the four cards. I am off to make some more cuts from those (and my other) new Cricut cartridges! Thanks for stopping by. Feel free to leave a comment or question and subscribe. Posted in Cricut, Embossing Powders, stamps, VersaMark and tagged ac moore, Alice in Wonderland, butterfly stamp, cartridges, Cricut, Disney Classics Cricut cartridge, Donald Duck, Fiskar's edge punch, Hero arts shadow ink Grape Juice, Joann's, Mickey and Friends Cricut cartridge, Minnie Mouse. Bookmark the permalink.